There’s no way around it: remodeling your kitchen is typically expensive — and intrusive, kicking you out of your cooking space for weeks, even months. Most home owners will spend between $12,000 and $19,000. 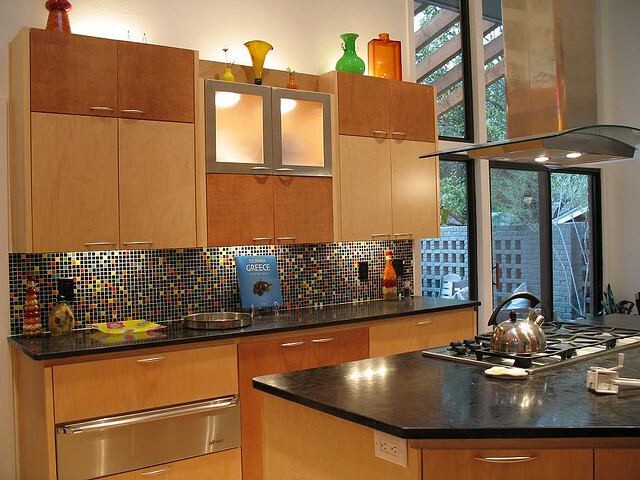 Some high end kitchen remodels can cost as much as $80,000 or more. But with smart decisions and careful planning, you can save thousands. Read on to learn how you can save money on your kitchen remodel, including cabinets, countertops, appliances, and flooring. Know your priorities: Not everything has to be top of the line, though it is smart to splurge where you really want to invest your money. Consider what’s important to you, and what’s not so important, then budget accordingly. Shop at Habitat for Humanity ReStores: Look for surplus or gently used home improvement items at ReStores, where you can pick up a great deal. Avoid knocking down walls: Removing a wall can be complicated and expensive, as you may need to relocate utility lines and other important components within the wall, and then repair the wall, floor, and other areas left open. If you want to open things up without losing a wall, consider creating a cutout with extra counter top space and even optional seating. Take it one piece at a time: While doing your remodel all at once will allow you to only live through the chaos of kitchen remodeling once, you can save money by simply taking care of single projects at a time when you’re able to get the best deals. Upgrade appliances one by one as you’re able to find them on sale, wait for flooring companies to offer specials, and find other opportunities to save on remodeling kitchen components by being patient. Plan ahead: If you want to do it all at once, be sure you have a detailed plan. A complete design plan can help you save on headaches, identify surprise costs ahead of time, and find solutions to problems before they become a real issue. Stick with your plan: Making changes along the way can get expensive. Once you’ve ordered products and started installing them, just go with it. Move your refrigerator, microwave, and other appliances to the garage while you remodel: If you’re gutting your kitchen, you’ll be without a cooking space for weeks, likely months. Set up a makeshift kitchen in your garage with your refrigerator, microwave, toaster, and even your dishwasher if you can. Consider grilling outside as well. This can help you save on eating meals out at restaurants. Shop around for contractors: Don’t go with the first contractor you find (unless they can offer a great deal). Go over your plans, talk about materials, and ask for bids and references to find the contractor that can offer you the best work for a great price. Be sure you know what you want before you get started with contractors so you can compare apples to apples. Shop around for materials: Consider a variety of sources for your materials from big box stores to local makers. Consider used or display items: Salvage stores or cabinet shops often sell kitchen materials at a deep discount. Reuse what you can: Before you demo, see if anything is reusable. For example, if you’re pulling up tile from the floor, consider using it for your back splash! Don’t move plumbing or gas lines: It can be very expensive to change the location or extend plumbing or gas lines, so avoid this if possible. Be willing to flex on your materials: Don’t get your heart set on specific materials. See if there’s a cheaper way to get the look you want. Donate reusable materials: Instead of paying to have old cabinets and other major kitchen components removed and taken to the dump, contact Habitat for Humanity. They may be interested in removing your materials and fixtures and then reselling them. You can even get a tax credit for your donation. Avoid or cut down on recessed lighting: If you’re adding lighting, go with track lighting or other ceiling mounted lights. They’re much cheaper to install, and you can typically get more wattage out of them. Budget extra for surprises: Don’t get caught by surprises like asbestos, electrical upgrades, bugs, or leaks. Plan ahead for kinks in the plan by budgeting 10% for extra costs. And if you end up having no surprises, you’ll have 10% that you don’t have to spend — or you can use for an upgrade at the end. Ask for referrals: If you have a contractor you like, ask him or her if they can refer a plumber, electrician, etc. You may not necessarily save money, but you’re more likely to find quality work from them — which ultimately offers more value. Be careful about funding: Remember if you’re using a home equity line of credit or a second mortgage, you may be paying for your new kitchen for several years. If you can save up ahead of time to afford it, cash will always help you save on interest. And if you can pay cash, let your contractors know: you might get a discount. Open a store credit card: While it’s best to pay cash, a store credit card from a big box hardware store might be a good idea. If you know you can pay off the balance quickly, you can save 10% to 15% off your total purchase when you open up a credit card account. Use standard sizes: When purchasing materials, remember to stick with stock sizes. Custom sizing will always be more expensive. Repurpose furniture for your kitchen island: Instead of purchasing cabinets for your kitchen island, consider using an old dresser or even a kitchen table at countertop height (36 inches). If you’d like, you can add a countertop surface to it so that it matches the rest of your kitchen, and even refinish it so that the wood is the same as your cabinets. Choose ready to assemble cabinets: Custom cabinets can cost $40,000 or more, while ready to assemble cabinets are usually less than $9,000. If you’d like to add custom touches, you can add on features like under cabinet lighting, organizers, and updated doors yourself for less. Go with open shelving: For everyday dishes and other items that are used regularly, consider using open shelving storage. This can open up your kitchen and save thousands on the cost of cabinets, as you can get this look with painted planks from the hardware store. Forget soft close drawers: This feature is convenient and feels nice, but is completely unnecessary. Use cabinets that match your flooring: If you’re not planning to update your flooring, be sure that the cabinets you’re buying will fit exactly in the same configuration. This is another good reason to stick with your old cabinets. Add your own storage solutions: Custom kitchen cabinets typically offer the option of lazy Susans, extra shelves, and other organizers. Buy these separately from a hardware store to create your own solutions and save. Forget trim, moldings, and decorative hardware: These extras can add up fast, and can be added later. Use granite selectively: Love the look of granite, but not the cost? Consider putting granite on your island or bar, but using another material, such as butcher block or concrete for the rest of your counters. Cut back on materials: Instead of purchasing granite, consider using quartz or other stones, tile, concrete, or even recyclable products. Laminate and butcher block have come a long way as well. Buy granite directly: If you’re set on granite, consider picking out your own. Buying directly from the slab distributor can help you cut out the middle man and save 25% or more. Cut back on your grade and finishes: Granite can come in grades both high and low, so consider a mid to low grade for a better return on your investment. And the way your countertops are finished makes a difference, too, so ask about how you can save on installation with a simple finish. Use granite tile: Granite slabs are expensive to come by, but granite tile with thin grout lines is a lot more affordable. Consider prefabricated slab granite: You can find standard sized prefabricated slabs for a fraction of the cost of regular slab granite. Tile your own backsplash: Tiling backsplashes is labor intensive, and therefore, can be expensive. Do the tiling job yourself and save. Purchase energy efficient appliances: Save on operations costs by purchasing appliances that are energy efficient. You’ll save on your gas, electricity, and even water bill every month. Shop in the early fall: Retailers are always eager to move appliances quickly in the early fall, as last year’s models need to move out so that the new models can come in. You’ll be more likely to see discounts and may be able to strike a good deal. Buy mid range appliances: Unless you use all of the features a professional stove or other appliance will offer, it’s not necessary to buy top of the line models. Standard brands like GE, Samsung, Bosch, and Jenn Air are a good investment, and still offer plenty of service and convenience. Don’t move your appliances: Relocating appliances is often very costly. You’ll need to move outlets, and may have to refinish the floor or walls that are exposed after the move. Pick up a floor model: Floor models are never used, but may have a few scratches and a little dirt. But with a good cleaning, your floor model (purchased for about half of the price of a regular one) will work just as well. Shop for scratch and dent models: Floor models aren’t the only ones offering savings. Shop scratch and dent outlets, where you can find appliances that have been returned or very slightly damaged at a significant discount. Typically, these models will still be under the manufacturer’s warranty as well. Ask for a deal: If you’re buying more than one appliance at a time, ask for a volume discount. Buy used appliances: Keep an eye out on local garage sale sites and Craigslist to see if any used appliances in good condition pop up. This is most common around prime moving times in your area. Find discounted flooring: Shop online or visit outlets like Lumber Liquidators to find flooring at a discounted price. Install flooring yourself: If you’re working with tile, laminate, or hard woods, this is a DIY project you can probably handle. You can save hundreds (or thousands) by purchasing flooring direct and laying it down yourself. Help out the pros with the installation: If you’re not ready to do the full installation, you can at least save a few hundred dollars by getting things started. Tear up old flooring and get the subfloor level to save on costs. Use porcelain tile: Instead of natural stone, use porcelain tile, which can stand up to chipping and cracking. Choose laminate over wood: Real hardwood floors can get damaged in the kitchen, but laminate can take a beating. It’s also typically much cheaper to get laminate than hard woods. Ready to tackle your next kitchen remodel? Don’t forget to protect your investment with a home warranty. Also, check out or beginner’s guide to home remodeling to see the average remodel costs of every part of a home.